Cost: Varies, depending on materials selected. Approximately $10-15 as shown. These earrings take advantage of the new larger link oval chain in sterling silver that is now available in bulk lengths from many popular jewelry suppliers. 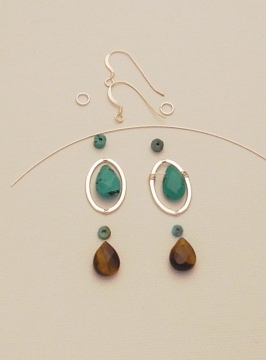 In this design, I have wire-wrapped a turquoise briolette bead inside one of the wire links, to create a focal point in the earring drop. Accents of a tiger's eye briolette bead, and some heishi turquoise beads complete the design, along with a sterling silver hook earwires. 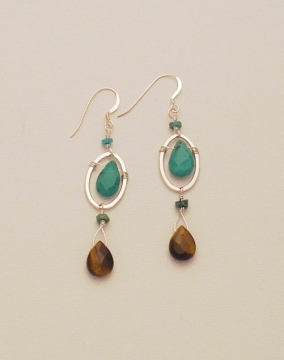 Want to make these earrings, or a variation for yourself? Let's get started! 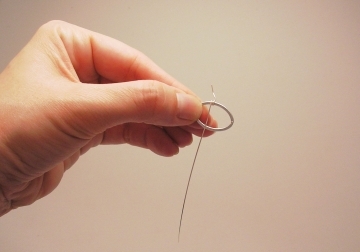 Sterling silver wire for wrapping the briolette beads and attaching the earring to the earring component. I use 24-26 gauge half-hard sterling silver wire, but use whatever wire you prefer as long as the wire diameter fits through your bead holes. Two briolette beads of your choice. Here I am using a genuine turquoise briolette, and a genuine tiger's eye briolette bead. Two small accent beads or crystals of your choice for the top and bottom of the pendant link. Here I am using turquoise heishi beads. Two earring components of your choice. I am using french hooks, but you can use leverbacks or posts if you prefer. Snip through a link in the oval chain so you can remove the solid link that you need to make the earring. Let's start by making the focal of the earring. Cut a short length of sterling silver wire, about 4 inches. TIP - If it is too long, you won't be able to wrap it inside and around the oval link. First, you'll want to eyeball where your briolette will sit inside the link. Place your briolette bead inside the link and determine where you will attach the bead to the link. Begin wrapping the wire around one side of the oval link. Wrap it using your flat nose pliers to pull the wire tight. Go around the link 2-3 times, and trim off the end, tucking in the rough end with your pliers. Slide your briolette bead into place in the center of the link. This next step will be a little more difficult to wrap because you have less room. Snip the wire so you have just enough to wrap it 2-3 times around the link (about an inch), and begin wrapping the wire around the link, using your flat nose pliers to get leverage and pull the wire so it is tight and the briolette bead is positioned where you want it. Cut off the end of the wire and tuck in the rough piece with your pliers. Next we will wire wrap the bottom briolette bead (use the How to Wire Wrap a Briolette Instructions if you are not familiar with this technique). Wire wrap the lower briolette bead. Before completing the loop at the top and attaching it to the bottom of the oval link, add an accent bead. I used a heishi bead as my accent. 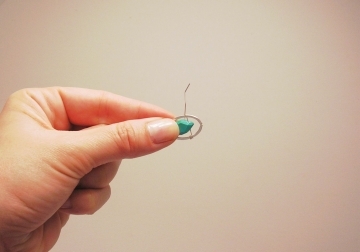 Complete the loop on top of the briolette bead while attaching it to your earring component using your flat nose pliers. That's it! 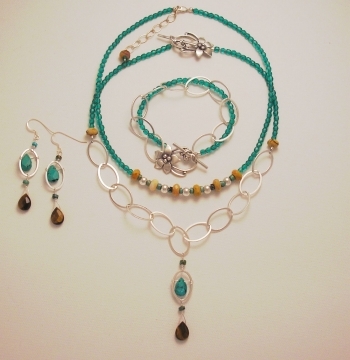 Here, I have made a matching set of earrings, and a bracelet. This makes a nice set! If you don't have briolette beads, you can easily vary this design by using 2-3 smaller beads of any shape inside the link frame. Or, try attaching a "spray" of tiny beads to the bottom of the link.